This year’s Super Bowl game itself was a let-down. But how did the ads do? Just like last year, most TV commercials just didn’t make the cut as effective advertisements. Instead of selling, they focused on entertainment. As a marketer, your job is to sell. Entertainment doesn’t sell. In fact, with ads like these, most people forget who the company even is. And, in some cases, the entertainment this time wasn’t very good. Brands and companies paid $5 million for each 60-second spot for an opportunity to sell their product or service to a viewership of over 103 million people. And, with many ads featuring big-name celebrities and high-level digital animation, they paid additional millions to produce the ads. What was the return on investment (ROI) for these ads? Only time will tell. But my guess is low and not worth it. Most brands and companies didn’t use proven direct response tactics to ensure a high response, and often didn’t communicate benefits to viewers. And few of the commercials had 1) The essential call-to-action (CTA), or 2) data collection for sales and accountability. 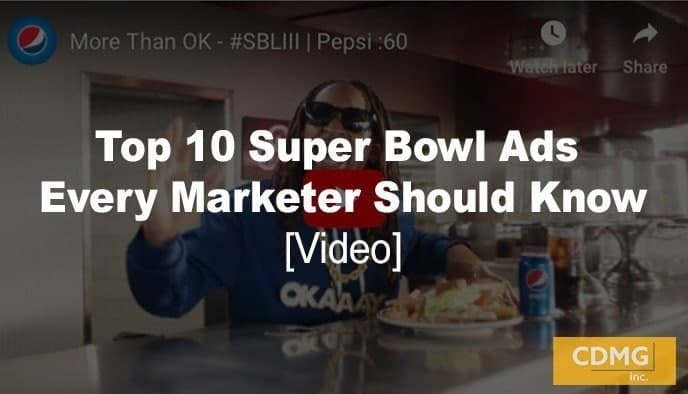 Let’s take a look at 10 Super Bowl ads that every marketer should know – the most talked about, the most controversial, and the most – and least – effective. “More Than OK” took on the line that servers ask at restaurants when Coke isn’t available – “Is Pepsi OK?” and argued that Pepsi is “More Than OK”! It featured comedian Steve Carell and rappers Lil John and Cardi B, and was certainly clever and entertaining. But it didn’t ask the viewers to drink Pepsi, didn’t feature a URL or a hashtag and didn’t offer anything of value. A missed opportunity. “Human Canine Show” was memorable, but odd. And it had nothing to do with avocados. Showing a role reversal of humans and their pets in a dog show, the commercial at least started with a quick list of benefits: “healthy, delicious on everything and always in season.” And, the end of the commercial showed a tagline and URL (but no hashtag or call-to-action). Other than using a hashtag (#ForTheThrone), the ad did not use any direct response principles – including a strong call-to-action, benefits or value-added component. “What’s for Dinner” was funny and relatable — and it offered something of value to the viewer. This was some of the best direct response copy in any of the commercials. It uses “you” and tells us an exciting benefit of using T-Mobile: free tacos. It’s also a powerful value-added incentive to sign up for the cell phone service. The failure of the ad was that it didn’t tell the viewer exactly how to sign up for T-Mobile – It did not include a phone number or a URL. The ad was funny and relatable, and it stated the benefits of using Shopper Assurance. However, the ad would have been stronger – and made more sales – with an on-screen URL and stronger call-to-action. Plus, there was no data collection. “Not Everything Makes the Cut” showed the hilarious (and fictional) consequences of what happened when Amazon employees put “Alexa” voice technology into different appliances and machines. The ad featured a couple of celebrities, including Harrison Ford and Forrest Whitaker, and it was very memorable. The end of the commercial, however, didn’t even put the brand name on-screen. It showed only the Amazon symbol (a curved arrow), and left viewers to remember the commercial … but not actually buy Alexa. No CTA. No data collection. “Expensify This” relied on a bizarre, big-production commercial that showed an over-the-top parody of the life of a wealthy rapper. This ad was odd and entertaining … but it also used two direct-response principles: a strong call-to-action and a value-added component. It’s a gimmicky plan not to actually download the app, but to get something of value everyone wants: cash. And, viewers have to download the app to get it. Plus, the ad did not use any direct response principles. A big fail. The ad failed completely to get new subscribers for the newspaper – There was no URL, phone number or even a call-to-action. Skechers’ commercial for their slip-on footwear featured Tony Romo – an ex-NFL player explaining why he loves his Skechers slip-ons. The ad was clever and entertaining, and it also told the viewer the benefits of wearing Skechers. Plus, by using a relevant spokesperson that actually wears the product, Skechers did a good job of proving their credibility to the viewer. The weakness of the ad was that the commercial did not tell the viewer where or how to actually buy the shoe and had no data collection. This was a disappointing failure after an ad that was otherwise very effective. Great commercials engage with benefits, not features. They should have a Unique Selling Proposition (USP). They create desire and motivate a response. After watching the 2019 Superbowl ads above, most this year did a poor job of meeting any of these criteria. Missed opportunities. And a lot of wasted money at $5 million a slot. The two most effective direct response commercials were commercials for T-Mobile and Skechers. T-Mobile gave the viewer a great incentive to sign up for the service, and Skechers did an effective job at communicating the benefits. But still, they did not successfully call the viewer to action. Another key principle – don’t offend and alienate. Some ads were downright offensive and alienated audience segments. Hulu’s anti-Christian, anti-Conservative commercial, for example. Another company – Zaxby’s – ran an ad making fun of Chick-fil-A for being closed on Sundays – mocking Christians. TV commercials and video can be a powerful way to get a high response. But they have to use the right strategies. See our article on Direct Response TV here. Effective commercials aren’t entertainment. They’re strategic marketing tools designed to drive up sales. I’ve created over 300 videos, including 13 infomercials. If you’d like to talk to me about how you can create a powerful video ad for your business, let’s talk. Give me a call at (310)212-5727, or email Caleb at caleb@cdmginc.com.